Calm, the continuation of taste - leavened wort, bitterness of dark beer, some coniferous-resinous notes, butteriness, varnish, oak, little camphor, eucalyptus and mint, raisins, dried apricots, weak shades of tropical fruits. A nice whisky, but it's not all there. A good performer, but half the time, she calls in sick. A bit closed initially but there is a hint of fruits at the tail end. Also a healthy dose of sweet corn bourbon, but we are told this is a single malt, so all barley here. Not a fruit bomb because it shares the stage (unfortunately) with a bit of oak and bitterness, but there is clear apricots and persimmon and a hint of mango. Not very memorable. A bit medicinal at the end. [August, 2015] Together with friends I emptied bottle no 632 that I bought for 163 Euro in November, 2004.In my old rating system (ten scales that translate into WB points: 50 - 66 - 75 - 80 - 82,5 - 85 - 87,5 - 90 - 92,5 - 95) I scored this 92,5. My notes state a great old style dram with a fruity and malty profile amd lots of OBFs. A style that is not produced anymore since decades. Its nice enough but not one tat I would say demonstrates how good Lochside can be. Similarities to the 1963 Clan Denny Grain, quite subtle, peach, apricot, hint of vanilla, a little honey, burnt orange, salted caramel. There is some depth here and nice flavours but its a little flat at the same time. With the flatness is a little bitterness but the profile is not strong enough to offset it. There is some toffee and a few wine notes I think, chocolate orange. Today I reminded myself that Lochside also made grain, though this is a single malt however. N: A soft old-bottled one with a touch of sooty smoke which helps to place it, date wise. Fruit-wise the Cavalier gets it spot on: tomato plant - specifically the sticky/pollen-y stalks & stems of the plant, not those ambiguous 'tricksy' fruits themselves. Fruit sugars begin to emerge with a little garden shed [more from that sooty side], as i go in for my first sip of the day. T: Soft [again] & narrow arrival with a delicate woody creamy body. A tricky one to read first up given the complex subtleties, such are the hardships of a whisky enthusiast. More contemplative time needed. F: I find the finish fairly short with a polite/considerate tannic grape skin and bitter wood finish. Lochside 1966 is always a delight. 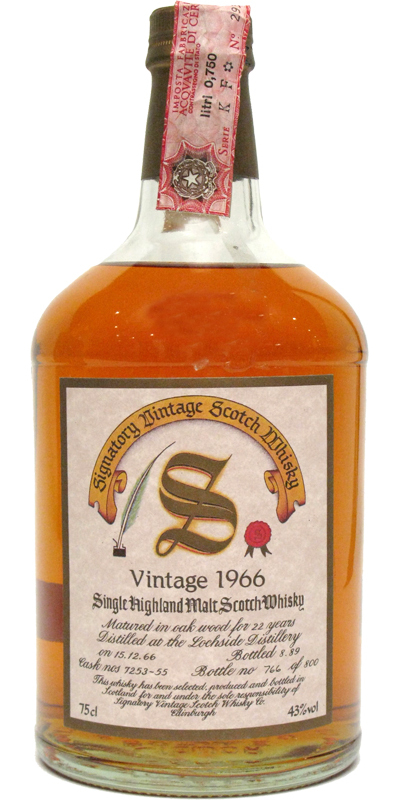 The nose of this relatively young expression of 1966 is gorgeous (90+). The palate lacks a little punch in my view though (82). Subtle tropical fruits of mango, pineapple and papaya. Also vanilla sweetness of cake mix and custard powder. Sweet barley. Polished oak. Complex. Orange marmalade. Lemon. Juicy oakiness. Caramelized nuts. Raisins, Pine at the background. Unfortunately a little thin. Medium long. Bitterness of pink grapefruit. Metalic notes. A little pepper. Spearmint. Gingery.